When he stands for re-election in 2020, President Donald Trump said he will likely be facing a Democratic socialist. 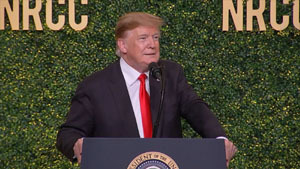 “We’re going into the war with some socialist,” the president said in a speech to the National Republican Congressional Committee (NRCC) on April 2. Trump hinted that the socialists in the Democratic Party also may have played a role in the recent controversy surrounding Joe Biden. “It looks like the only non-sort of heavy socialist, he’s being taken care of pretty well by the socialists. They got to him,” Trump said of Biden. “I was going to call him, I don’t know him well, and say, ‘Welcome to the world, Joe. Are you having a good time?’ ” Trump continued. Later in his speech, Trump joked that he was so happy after a U.S. general told him that ISIS was defeated that he said he wanted to kiss him. “I felt like Joe Biden,” he said, as the crowd laughed.